One of the most stunning aspects of the Eastbourne Downland is the Heritage Coastline of pure white chalk cliffs. The erosion of these cliffs by the sea is often thought of as a destructive process but it is this erosion which creates and maintains the cliffs’ magnificent whiteness through constantly eroding the old cliff face and revealing the clean white chalk underneath. The white cliffs of Beachy Head and the Seven Sisters have been eroding for at least 10,000 years, ever since the end of the last Ice Age. The base of the cliff is attacked with tremendous force at high tide as the waves break against the chalk. Shingle is also thrown at the cliff and pockets of air are trapped in the crevices and alternately compressed and decompressed. These forces combine to erode a notch in the base of the cliff which eventually cannot support the upper parts of the cliff. The cliff is also weakened from the top during the winter as rain water in the soil freezes and expands, pushing the rock apart, and then thaws and runs through the crevices. A section of cliff then tumbles to the beach, creating a temporary defence against the waves until it is broken up and washed away. One of the key conditions of the management of the Heritage Coast is that it is left undeveloped in order to preserve the landscape value. This means that no sea defences will be built to slow the natural process of erosion, not even to save existing buildings. Belle Toute Lighthouse was moved back from the cliff edge on March 24 1999 in order to save it from an imminent collapse into the sea. The Heritage Coast recede an estimated average of about ½ -1 metre a year. Occasionally there will be a larger than average cliff fall, such as that on January 10 1999 when up to 6 metres of cliff edge tumbled away, to a depth of 17 metres over a 70 metre long stretch. As global warming continues and sea levels rise the rate of erosion is expected to increase and falls of this size will become increasingly common. Information from the Applied Geology Research Unit (AGRU) of Brighton University. With thanks to Eastbourne Borough Council you can download Tide Tables. Always make sure you refer to the tide tables before venturing on any walks at Beachy Head. I perform talks about the Lighthouses of Beachy Head and would welcome the opportunity to talk to your group about the fascinating history of Beachy Head's amazing lighthouses. How old is the Belle Tout Lighthouse? 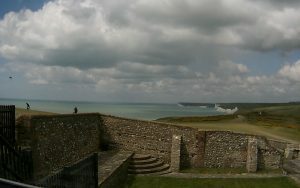 The light from the Belle Tout lighthouse first shone on the 11th October 1834. The lighthouse is 185 years old. 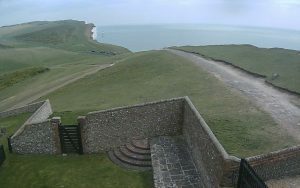 Looking for photos of the Belle Tout Lighthouse? Did you know that the fragile chalk cliffs are eroding at an average rate of 60 centimetres per year!